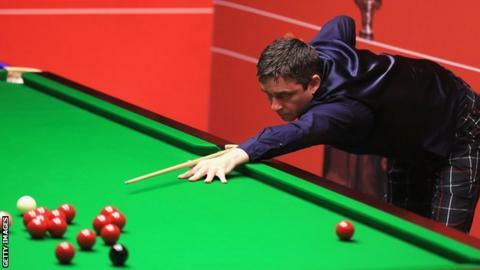 Alan McManus has revealed motivational notes - as well as his lucky trousers - have helped his run to the World Championship quarter-finals. In his first second-round match since 2005, the 43-year-old Scot beat Ken Doherty 13-8 to set up a last-eight showdown with Mark Selby. "I've been writing phrases on bits of paper and taking them out with me," said McManus. "It's a couple of technical things but the last words are just 'enjoy it'." And he added: "There's a lot worse things going on in the world than me or anyone else losing a snooker match. "It's easy to forget that sometimes but you only need to look at the TV for an hour ... there's some not so pretty things going on. "I'm trying to enjoy it because you never know how many times you're going to be back here. I'm pretty philosophical about it and I try to be relaxed because if you get uptight it can get to you." McManus suggested his trousers may have become his good-luck charm. "I can't get rid of the things, I only brought one pair down," he explained. "I probably should get a different colour now, people will get sick of looking at them. "It's a bit of fun and hopefully it adds a little something to the tournament, no matter how small. "I guess I'm going to have to wear them again in a couple of days' time. They are maybe a little bit of lucky omen, so I'll keep wearing them, probably because I've got no choice. It's either that or a pair of denims and I don't think that would be allowed." Against Selby, McManus expects to be a "massive underdog". "When I get my chances I'm going to have to take them because Mark is so used to the big stage now and he's one of the top three or four players in the game," added the Scot. "I'm going to have to cut out the silly mistakes. I do like playing the big names, I always have done. "It's a really big occasion and I'm really looking forward to it. A lot of guys don't get the chance to play a quarter-final here." Meanwhile, McManus has welcomed the prospect of countryman Stephen Hendry returning to the World Championship next year. The seven-time winner could come out of retirement following changes announced by snooker's governing body, which will involve every living former world champion being invited to play in the qualifying rounds. "I'm glad he's going to play ... if he plays. The same with Steve Davis," added McManus. "I'm sure he's been watching people miss balls and thought 'I need to get back into this'. "Then reality kicks in when the cue comes back out and it's tough out there but I'm sure he'll handle it really well because of the man and player he is. I can't wait to see him play again."